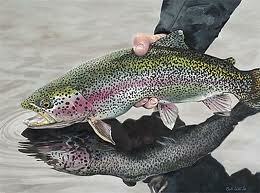 Asked whats in season and I would have to say "not to much" Trout season ended Sept. 30. Salmon season ended Oct. 31. There is some fishing to be had at Cameron and Gillis Lake, Antigonish County and Gairloch Lake, Pictou County N.S. bag limit is reduced to two rainbow from Jan.1 to Mar. 31. Chain Pickerel can be fished all year round at Black Lake , West Branch Lake, Pictou County. White and yellow Perch can be fished year round at Cameron and Gillis Lake as well. So basically I,m just cleaning some gear and tying up some flies waiting for the ice so I can do some smelt fishing. I can,t wait for Trout season to open again so I can hit my favorite rivers and streams. Heres a blog I did last year at this time on the same subject, there is a nice video on smelting.